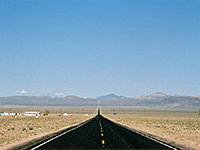 Nevada is a large, empty state with comparatively few roads. 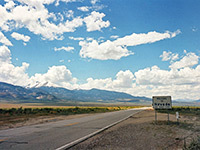 Most of the main highways run north-south, along the many parallel basins between generally impassable mountain ridges of the Great Basin Desert, although there is only one direct road across the whole state - US 93, near the border with Utah. Three roads cross from east to west; I-80 to the north, the lonely highway US 50 across the center, and US 6/NV 375 further south. Also notably scenic are NV 376 and NV 305, together forming a 200 mile route between Tonopah and Battle Mountain, right in the middle of the state. As Nevada has few major natural landmarks, the reason for driving is generally to visit the many smaller sites - historic places, ghost towns, old mines, hot springs, hidden side roads, or just to see the land itself. 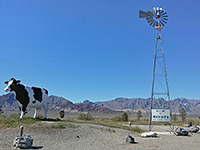 - a 40 mile drive through a colorful rocky landscape near to the northwest shoreline of Lake Mead. 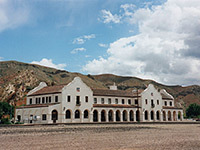 - from Beatty to Tonopah - 95 miles of hypnotic desert scenery with wide plains and distant mountains, between Death Valley and the huge Nellis Air Force Base. 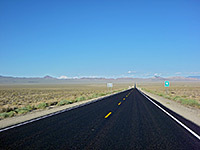 After Tonopah highway 95 continues northwestwards, merging with I-80 for one long stretch, and later enters Oregon and Idaho. - a little-travelled route starting from I-80 east of Reno that leads past Pyramid Lake, the largest body of water in Nevada, and on into the most remote part of the state - a wild land of salt flats, dry lakes, mountains and scattered volcanic features. 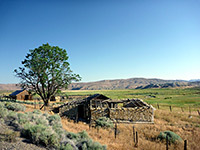 The road becomes unpaved at the small settlement of Gerlach, circles the Black Rock Desert and continues through more empty wilderness into California. - a short diversion near Las Vegas; this scenic loop road climbs into the Spring Mountains towards Mount Charleston, one of the highest peaks in the state at 11,918 feet. En route there is a quick transition in vegetation zones, from desert to Alpine.